Outdoor escalators and art have helped change what was once a notoriously dangerous part of Medellín. 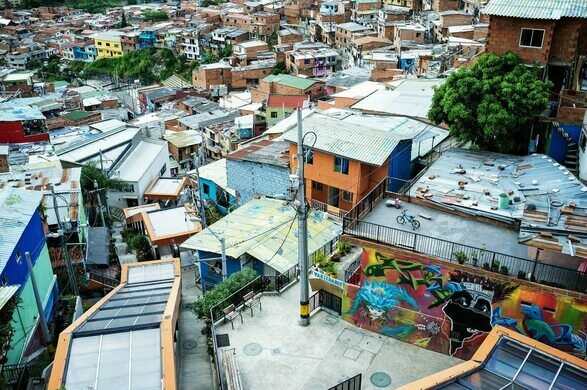 Comuna 13 used to be one of the most dangerous areas in Medellin but community projects and a series of outdoor escalators have helped turn this poor district into one of the most colorful communes in the city. Two identical statues by Fernando Botero, one blown to pieces in a terrorist bombing, the other donated as a gift for peace. An unusual and beautiful form of mass transit serves the city's steepest neighborhoods. Throughout the 80s and 90s, Comuna 13 was considered one of the most dangerous neighborhoods in the world. It was run by violent drug trafficking organizations, who used the poor, sprawling hillside barrio as a transit route in and out of the city, and served as a stronghold for guerrillas, gangs, and paramilitaries. But things began to change in 2002 when President Alvaro Uribe launched Operation Orion, a raid on Comuna 13 spearheaded by 3,000 troops backed by helicopters. It was a brutal and controversial beginning. During the first week of the raid, at least 18 people were killed, 34 wounded and almost 250 arrested in Comuna 13. The neighborhood’s 100,000 residents were caught in the crossfire, resulting in arbitrary detentions, disappearances, and hundreds of injuries. During the following decade, the government set about improving the hillside commune, redeveloping the brick houses and building community centers but access remained a problem. So, in 2011, the government installed the escaleras electricas, a series of outdoor escalators that extend for 1,260 feet (384 m), connecting parts of the once chaotic and isolated hillside neighborhood to the city below. The escalators gave residents newfound freedom and brought about a total shift in the local mentality. Kids began to play on the streets once again, and local artists felt safe enough to go out and brighten up their neighborhood. 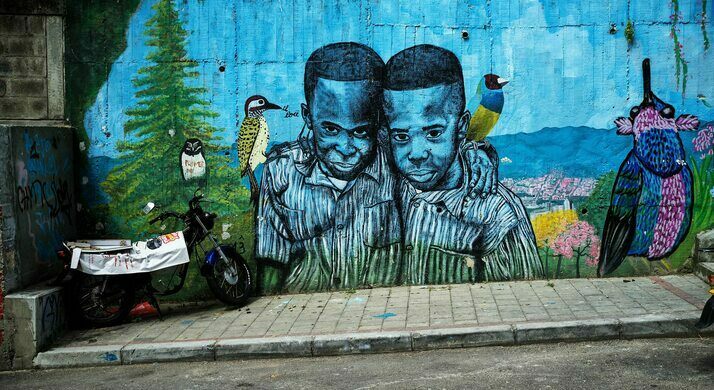 The result was the creation of one of the most colorful communes in Medellín. 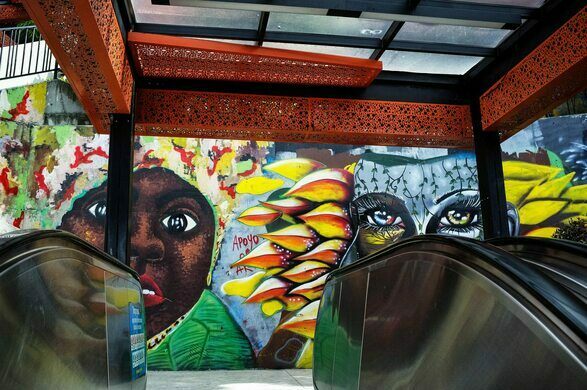 The area surrounding the six sets of escalators is now covered with murals and graffiti, with bright colors and street art decorating walls once riddled with bullet holes. 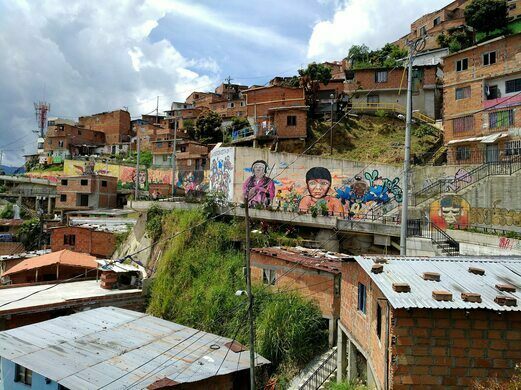 Many murals tell the story of Comuna 13, or depict local heroes, the artwork sliding by as you ride the escalator up to the top of the hill, where a lookout and boardwalk provide excellent views across the city. 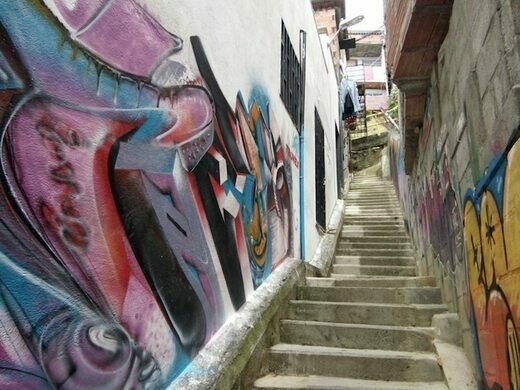 It’s been a dramatic shift for Comuna 13, and tourists now come to ride the escalator and see the street art. But despite the improvements, it remains a poor and not entirely safe neighborhood. Comuna 13 still has a long way to go, but at least the future looks far brighter for what was once one of the most dangerous neighborhoods in the world. 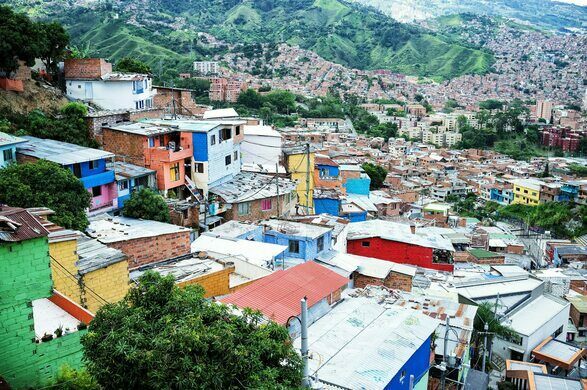 Comuna 13 (San Javier) is located in Zone 4 of Medellín, along the western fringes of the city. To get to the commune, take the metro to San Javier metro station. From there, it’s a 15 to 20 minute walk to the foot of the escalators, or you can take a bus (221i or 225i). 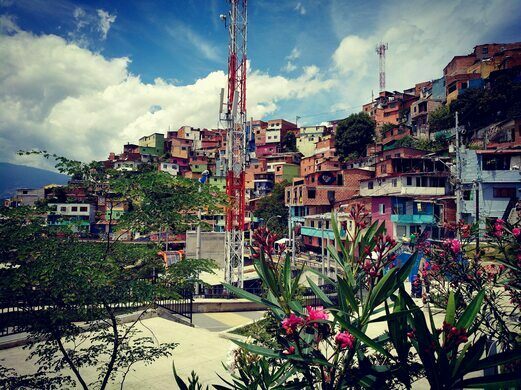 While you can visit Comuna 13 independently, it’s best to go with a local guide. The area still suffers from poverty and violence, so having a knowledgeable local with you will make the trip safer and more interesting. Comuna 13 tours aren’t part of the “dark tourism”/"narco tourism” thing that you’ll find in other parts of Medellín, or at least they shouldn’t be. Do your research before choosing a local tour operator or guide, and pick one that has genuine connections with the community. If you do go independently, go during the day and stick to the area immediately surrounding the escalators. This city park wants you to take your shoes off. In the heart of Medellín, an artsy urban complex sets the stage for demonstrations and protests. Three hundred illuminated pillars form this “artificial forest” in Medellín. Home to 23 voluptuous and instantly lovable sculptures by one of Latin America's most celebrated artists.